Photography is something I can talk about for hours, I've loved it for years and it's one of the only things I'm actually "alright" at! I've definitely learnt a whole lot more about photography since blogging and I thought I could share my tips for getting good photos as I think it is important to have great photos when running a blog. The camera I use for blog photos is the Canon 600D, although you don't need a DSLR, if you know blogging is something you definitely want to be doing or you use it for other projects, I would really recommend investing. If you're just starting out blogging, perhaps buy a more affordable camera, until you know that it's something you definitely want to do. Although there are other DSLR's that you can buy, I think it's good to stick with Canon or Nikon as it's so easy to find lenses for them, however if you buy another brand it may be slightly more difficult to find them and there may not be as many to choose from. It's a good idea to play around with your camera settings to find which one works best for your lighting and set up, on my camera I often use the Creative Auto setting, this allows me to change a few things around. I also think it's a great setting to use if you're new to cameras as it is really simple. I change the setting to "brighter" which makes a huge difference to how my photos look. I also use the manual setting, when you use the auto settings it means that your camera is setting things like the white balance for you which can sometimes cause problems. I also tend to use the Manual Focus as you can't always trust Auto Focus, with manual I find it a lot easier and quicker to get a good shot. You need to remember that you can change the brightness on a photo but if it's out of focus, you really can't work with it at all. I genuinely believe that you don't need a fancy camera to get good photos, I use a Canon 600D because I bought it for photography and I use it for a number of things other than blogging. If you're not sure whether blogging is definitely for you or if you can't afford to shell out on a camera you can buy really cheap alternatives. One of my favourite bloggers uses her iphone to take her blog photos and they are still amazing! When I first found her blog I asked which camera she used as I fell in love with her photos and she said she uses her Iphone! I also need to point out that getting a fancy camera won't make you a great photographer, you can still get awful photos on a £1000 camera but great photos on a £100 camera! I always say to never use flash, ever. I remember back in a photography class at college the first thing I was told was "flash is not your friend." I genuinely hate flash and never use it for my photos, it makes photos look terrible and can make shadows very visible. A lot of people use backgrounds for photos, I've tried using a plain white background and didn't really like it. Some people use wallpaper as their background which looks nice. I just use the top of my Ikea drawers, I have some little trinkets in the background and usually have a shallow focus, so that the main products is in focus and the background is out of focus so it doesn't distract attention away from the main product. I think it's good to have a "style" of blog photograph, my setting is the same for pretty much all my photos and they are shot the same way each time. I never post photos that aren't edited, even if it's just the brightness, my photos can always look better. If you have Photoshop then that's a great programme to use however if you don't, a website like PicMonkey is great, it's what I do most of my editing on. Something I did when I first started blogging was over edit my photos, I got so excited by all the filters I could use, so I used them all! Now I pretty much only brighten images as it's so important to be able to see the colours of products, if you over edit them, your readers can't see what the colour actually looks like! When you are writing your blog posts and adding your photos, click on them and change the sizing. I make all mine "X-Large" so they are big and clear, there is nothing worse than a tiny little photo where you can barely see the product! 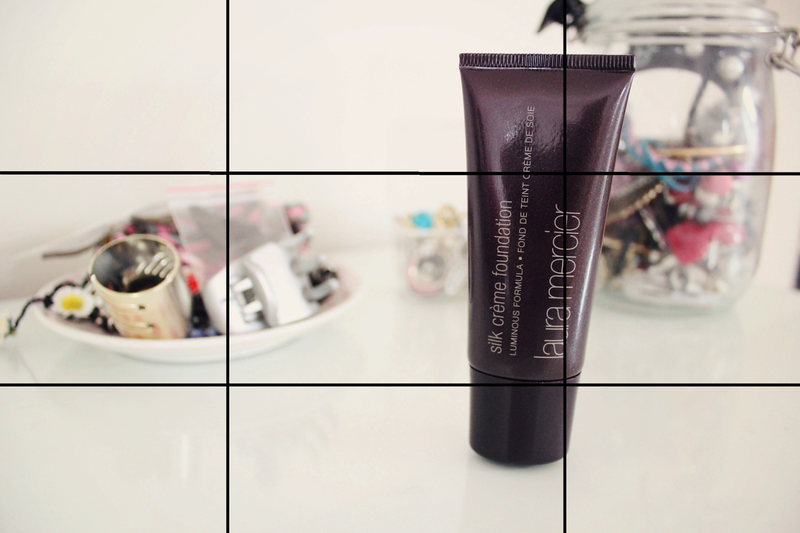 The rule of thirds is taught in both photography and filmaking, if you watch any film you will notice it. You basically have to imagine that your screen is split into 9 boxes and the screen is in "thirds." The way a shot looks good is if it's on the line. I often take photos so that products are on the line, this is generally more pleasing on the eye compared to putting a product right in the centre of the screen, although I still do this quite a lot! If you watch any film or TV show, you will notice this quite a lot. Lighting is so important, I think this is often where people go wrong with photos. The lighting can change the way a photo looks so much! Take your photos near to a window so you have lots of natural light, take your photos away from the light rather than towards the light. If I'm just using natural light, I take my photos between 12 o'clock and 3 o'clock because this tends to be when the lighting is at it's best. If you try and take photos at 6pm at night with natural lighting, you aren't going to get a great picture quality. As I mentioned, it is important to use natural lighting, don't use a lamp or normal house lights to light your photos, it will make your photos look very orange as it emits a warm yellow/orange light. You can buy studio lighting to make your photos brighter, this also helps if you want to take photos later in the day, for example if you're at work all day and only have time to take photos in the evening. You can get these from a number of different places including Amazon. I recently bought lighting from a company called Rotolight, I bought the Creative Colour Kit, I wouldn't say studio lighting is essential as I've used only natural lighting for about a year and a half, but if you struggle to find good natural lighting then I think it is a good investment. 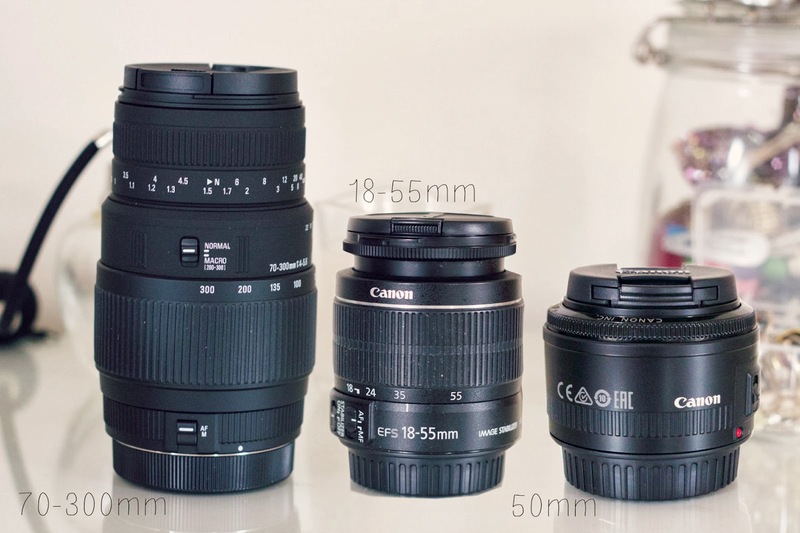 I also thought I would share my lenses, I own three currently. The first is the 70-300mm lens from Sigma, I don't actually use this for blog photography and taking photos of products, this is more of a general photography lens. It is a zoom lens and means I can take photos of things that are far away, with my old digital camera, I could zoom in lots, with DSLR's you need to buy separate lenses. The second is the kit lens, this is the one that comes with the Canon 600D, it does a good job and it was all I used for my photos, you can zoom in a little bit with this lens so it is quite handy! You can still get some beautiful shots with this lens so you don't necessarily have to buy a separate lens. Finally, my favourite lens. The Canon 50mm, this is Canon's cheapest lens but you get a great lens for the money. I bought it fairly recently but I love it already! This is a prime lens, so unlike the 70-300mm and the 18-55mm, it doesn't zoom at all. So, if you want to get a close up shot you actually have to move. This lens is brilliant and I think it's really worth the money if blogging is something you are serious about, I also have my eye on the 40mm lens which is about £50 more expensive, the 50mm retails at £75. 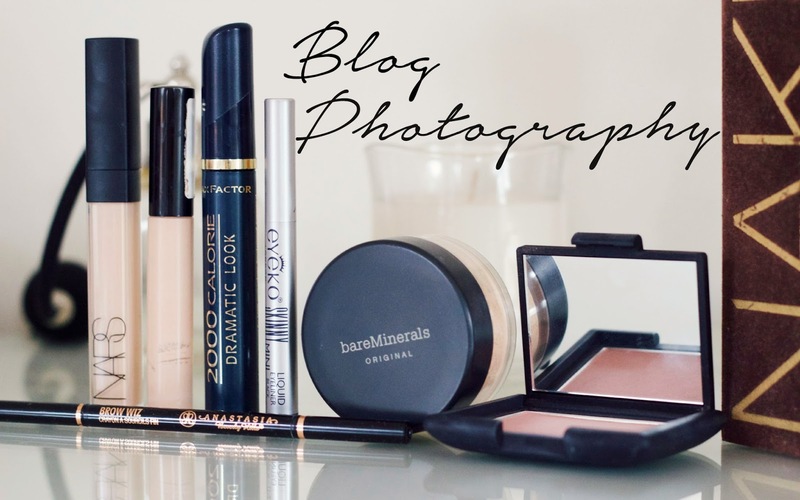 Brilliant post, I really enjoy reading about the photography aspect of blogging, seeing peoples tricks and what they use! I really need to up my photography game - I need some more lenses ! Thankyou for this post it was really helpful!